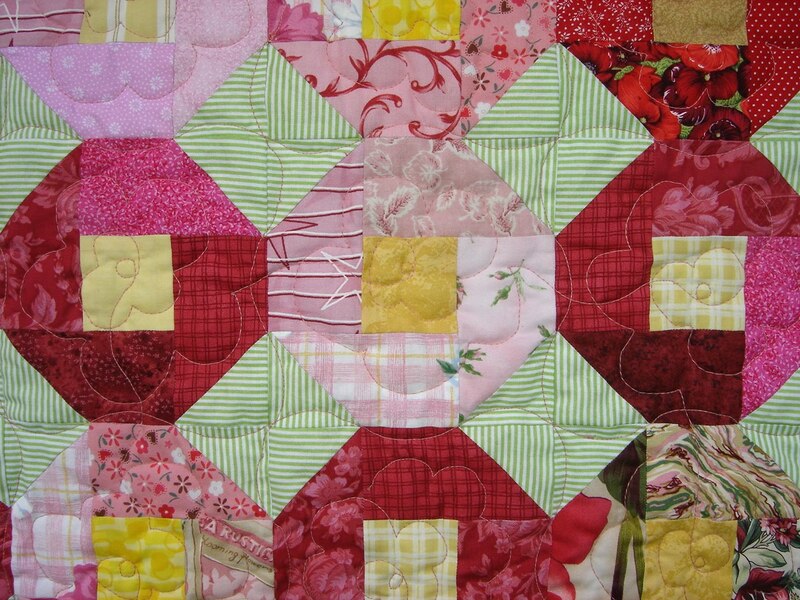 Home » blocks » A change in our timeline … and another quilty interpretation of a Rose. A change in our timeline … and another quilty interpretation of a Rose. Because I have started a temp job and will be in training for the next 2-3 weeks (without access to a computer), I will be sending out the sneak peek email (on Tuesday, August 24) and putting together the final list of names for the drawing on the last day of the month a few hours later in the day than usual. In case you’re curious, unfortunately, the job is really just NOTHING to celebrate and I still won’t be able to make ends meet, unless I decide I don’t need health insurance . . . but it is work and I am grateful for that. On a more pleasant note, if you haven’t already seen Béa’s blog, here’s a detail photo of out her “rose” quilt . . . made from shoo-fly blocks (with a different fabric placement than usual). Check out her blog article about her quilt, “Rosaraie,” for photos of the full quilt and the pretty rose-inspired quilting design. I can imagine doing something similar with liberated shoo-fly blocks, like those we made earlier this year. The photo didn't come through for me, but hey, you hang in there and do what ever you need to. The temp job is a job, and in this market that is good! Best wishes for you. Thanks, Pat. I reloaded the image in a different way and hope it is viewable by everyone now. Sophie, I decided to donate my chances on the two blocks I made this month. Congratulations on the job even if it is temp — it's good practice and will make you appreciate your free time even more! Best wishes for this job, it's always good . Hugs. Hope all goes well for you. Best wishes. Julie, I've made a note that you're donating your chances and updated the list … and YES, I am already appreciating my now scarce free time plenty! Glad you found something, temp is better than nothing, right? Remember to take care of yourself thru this, and sew when you can and SMILE! I know when the going gets tough, I often forget to just smile. Seems to cheer everything inside! make the blocks this month. But, there will be next month. Good luck on your part time job. the blocks so far look really nice. Best of luck on the temp job! Ya never know who you'll meet and what inspirations will come to you when you put yourself out there—hope you have some good luck! Good luck with your temp job and the networking it will bring you. (and maybe new friends?) We miss you in Dallas. A quilting question. Regarding the lovely photo of the quilt you posted, how would these roses be put together? Is the center square sewed to one of the trapezoid and then the others 'set in"? I'm guessing there's an easier way, but this doesn't look like a log cabin because no initial rectangle is created. (I'm somewhat of a beginner, so forgive my dumb question). (The reason I'm asking, is that my idea for my "terms of endearment" blocks from February is to separate them with blocks of various types of roses or hearts, and these would be a fun pattern to use, as well as this month's liberated roses. These are fun blocks – I'll have to get out Google translate and pop my contacts in to read the blog entries. Best of luck to you in your temp job in your new home!